Buying a new or used vehicle is an exciting experience. But before you start thinking about what color, make or model you want to purchase, you’ll need to ensure everything is in order: and one of the most important components of this is evaluating your credit score. If you’re buying a car 100 percent in cash, your credit score will likely never even come up in conversation. However, if you’re like most Americans, you probably can’t afford to make such a large purchase in cash—and that’s where your credit score comes into play. If you’re worried that your credit score is too low to enable you to buy a car with financing, I’ve got some good news and some bad news. The good news is that you can breathe a little bit more easily because rest assured, you will almost certainly find someone willing to finance the purchase of your car. The bad news is that if you have a bad credit score, it’s going to cost you a lot more to finance that purchase than it would if you had a spotless credit history. Your credit score basically is a measure to lenders of how safe of a risk it is to lend you money. If you have a perfect credit score, the lender is almost guaranteed not to have to chase you down and repossess the car for defaulting on your payments. As such, they will probably accept a low interest rate given the low risk. But if your credit score is lower, the likelihood goes up that you will be a flight risk, and as such, your interest rate will creep up—making your car purchase much more expensive in the long run. So just how bad is bad—and how good is good? Let’s start with the good. If your credit score is above 700, you can probably expect to receive a 5 percent interest rate. As your credit score drops, your rates will creep up—and once you hit 500 or lower, your interest rate will probably be around 15 percent or higher; yikes! Repeat after me: never, ever pay to see your credit score! Your credit score as reported by the major credit reporting agencies is very easily available: just type “free credit score” into your search engine. Many credit card companies also show members their credit score as a “perk” of being a card-carrying member. It depends on what your options are. If you absolutely must have a new car right now (is that ever really the case? ), then you’re going to have to settle for a higher interest rate. However, if you have the option, it is a very smart idea to take public transportation, carpool, walk, bike, or even borrow a car from a friend instead of buying a new vehicle with less than stellar credit. Often, free credit reports will show you a list of a few reasons why your score is the way it is. If your credit score is low because you have high balances on your credit cards, spend a few months paying down the balance before you even think of going to the car lot to look at vehicles. If your credit score is low for reasons that are harder to fix in the short-term, then you should consider talking to a certified financial planner (one with a fiduciary duty to put your needs before profits) and discuss your options. If you absolutely must have a car and are looking to save money, you are probably considering buying a used vehicle instead of a new one. Aside from the obvious fact that the sticker price will be lower, if your monthly car payment is lower, this will also allow you the financial wiggle room to focus on fixing your poor credit score. But you should be aware that interest rates are often higher for used cars than they are for new cars. The lower your credit score, the bigger the differential will be between the ​used and the new rate. While it will likely still be a better deal for you to buy a used car, it’s worth crunching the numbers if you have a really low credit score. There’s a difference between having a lower score because you don’t have much credit history and having a low score because you’ve previously gone into bankruptcy or defaulted on a credit card. If you have a score lower than 700, your job is to document, document, document. You will particularly need to make the case that you make on-time payments—and if you do this successfully, you might see your rates drop to that of those with a perfect credit score. Be prepared to back up your claims with evidence: bring credit card statements, rent payment receipts, and anything else that shows you pay on time and in full. 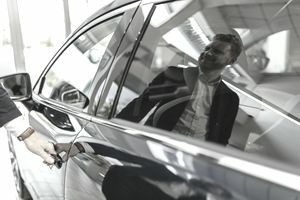 If you have a stable job and are able to put down at least 25 percent of the car’s value into a down payment, this could also help you secure a lower rate. If your credit score is below 500, these techniques probably won’t work so well for you, though that doesn’t mean that you shouldn’t try, and you should be prepared for a higher interest rate. If all else fails, it might be worth asking a relative or very close friend with stellar credit to co-sign your loan. If you do this, you might be able to secure a much better interest rate. Just be aware, though, that a failure on your part to make payments would mean that they’d be on the financial hook for the full amount of the loan. The most important thing you can do is to make on-time payments for the next 6 to 12 months. You should also focus on repairing your credit score. Don’t open new credit cards or apply for other loans: these things will be red flags on your credit report. After 6 to 12 months have elapsed, you should look into options for refinancing your car loan.